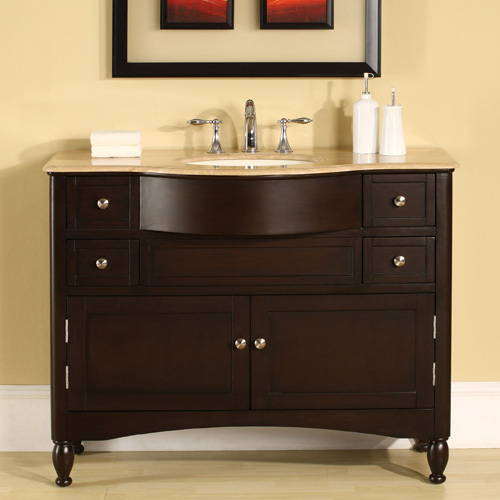 The Antillo Single Bath Vanity features smooth lines and a rich, dark finish that gives it a contemporary atmosphere. The Roman Vein-Cut Travertine counter top is pre-drilled for faucet installation and includes an under mount ivory ceramic sink. Its light color atop the dark cabinet is like the foam on top of a latte. For your storage needs, the cabinet features two doors and six drawers. The central location of the sink also allows ample counter space. Faucets are sold separately.